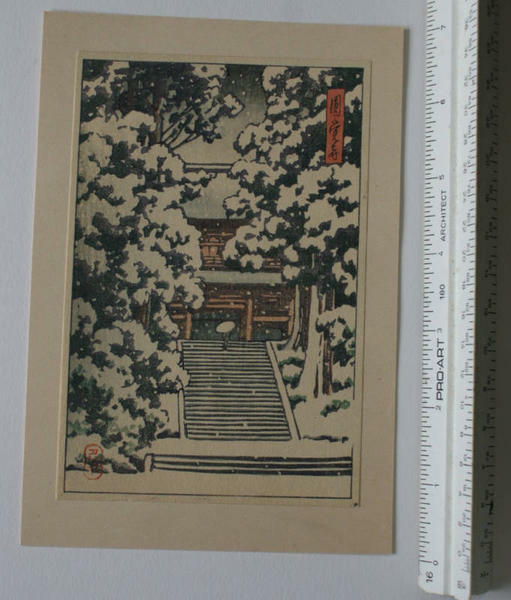 [Go Back] [New Search] Details for Kawase Hasui (1883-1957) "Enkakuji Temple"
A nice woodblock print by Hasui. Has a small red seal in the left bottem corner. Image is of a woman walking up stairs on a snowy day into a temple or shirne. Condition is good. print paper size: 5 7/8" x 3 7/8"